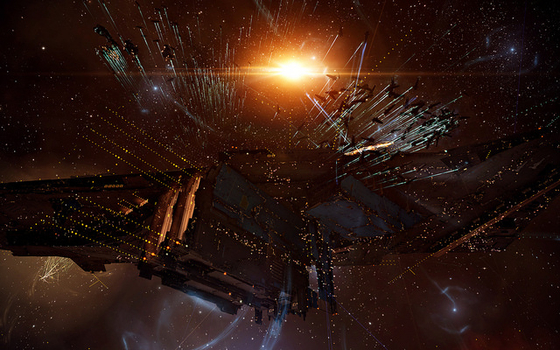 If you’ve been following /r/Eve, you will have noted the dramatic flip of a SLYCE Fortizar earlier today. While there has been quite a lot of talk about it, the motives have not been known. EN24 was able to get in contact with both defector King Voodoo, and his erstwhile corp CEO, Rush Crosix. King Voodoo told us that “[I] pissed off another director in the corp, and he made it his life’s mission to see me run out of the corp.” He went on to say that there were constant meetings between this director and the CEO. He also thought that his efforts to help the corp weren’t being recognized.It all culminated in an internal meeting last week, which he was late to. Apparently, when he did get on comms, they were all criticising him – but stopped when his presence was known.This was the final straw. He knew Asher Elias, of Goonswarm fame, through the Alliance Tournament. He got in touch and arranged the heist. The rest is EVE history. Corroborating evidence seems to suggest that this is the accurate account. While they’re not much to go off, Disqus comments on Rush’s EVEWho profile indicate that he is a well-liked and respected CEO. Meanwhile, EVEWho comments on Voodoo’s profile are vitriolic and accuse him of being a prolific thief. Moreover, said vitriol goes back some time, so it is not a recent event. Well, in some ways, it is expected. Few people pull off heists of this character for altruistic reasons. However, it also shows that hands-on management of people is crucial. Commentators after the fact noted that Voodoo’s EVEWho profile was ‘very sketchy’, but he was retained in various roles because he was quite competent. Sometimes, as Rush Crosix acknowledges, that sometimes, you need to “Remove toxicity, regardless of the upside.” That is a lesson which all of us could learn. Exactly how do you discover various blogs on Blogger with keyword or search? Leave a Reply to His Secret Obsession PDF Click here to cancel reply.